The beautiful fabric is a personal project I finished late last night, but more on that in a little while! Well, here's a hurricane story with a different twist! Last summer, through the wonders of internet, I was able to connect with my long lost best friend from high school, Holly. We discovered that we were only 60-70+ miles from each other, her being north of Houston and me being south....of course each of us have families and busy lives so we corresponded through email as a "catch up" and planned a day to make that journey through Houston to the other side to get together and see each other face to face. Such is life if you try to plan things. Sometimes the best things are just spontaneous! Just recently I joined the ranks of FaceBook, which has provided yet another way for my dear friend and I to try to 'catch up' or at least be current with each others lives....enter in a quick post from Holly that she and her daughter are on MY side of Houston looking for a car...I post back, 'keep driving south you're almost at my house' and the next thing I know the phone rings and I'm giving her directions!! Here we are, 30 years post high school, 20+ years since seeing each other. And guess what? No hurricane! Even though we could use some rain (grin). While she was here I of course shared my studio and one of the quilts I'd just finished. Here's a sneak peak - photos will be posted on webshots this weekend after the customer has picked it up - I never want my customer to see their quilt before they get here, I love the ah-ha moment when they see their quilt top turned in to a quilt. And a close up of another one that I actually did between the two above. So lots of company coming this weekend to pick up quilts. I have big plans for my weekend ( actually my customers are having to work around it to pick up their quilts) ....my church, Calvary Chapel Houston, is hosting a women's conference this weekend and I decided that I wanted a cover for my Bible....so after hours last night, this is what I made! I do not understand the uploading process of blogger. It has turned the photo and I don't know how to right-side-up-it-again. But for what it's worth, this is the pattern that I used, It's called Wrap it to Go by Terry Albers I purchased the pattern last year at the Houston International Quilt Festival and knew it would be perfect for this project. I loaded the fabric on my longarm (thankfully at 6 PM yesterday evening I had just finished the mariner's compass customer quilt and was able to slip on something of mine!). Since the fabric is a busy print I could have gotten away with any quilting, meandering, loops, even cross-hatching, but I decided to do little feathers to give it some texture (see the close up at the top of the post). The quilting took longer than the project I think, but it was enjoyable. As my hubby keeps telling me, enjoy the process, so I did. The pattern called for a pen holder, which is very important to me. I do take a lot of notes at church and am always searching for a pen. I added the tissue holder, which is just under the large flap that wraps the Bible. I did this because, again, I'm always searching for one. We have the most awesome praise and worship team at our church, they just lift us up to the throne in worship and more times than not there's cause for tears of joy, so a hankie is appreciated (grin) and then of course there's those convicting sermons .... anyway, I thought it would be nice to keep tissues in my Bible and used this "Almost Free" Tissue Holder Pattern from Ami Simms. I only put in a few tissues instead of an entire travel size package because it was too bulky. So that's my workin' overtime story. I have several other quilts to do today and in the morning before heading out to Women's Conference on Friday night. I'm hoping I can steal away a couple of hours this evening and make a tote bag or something...we'll see. So many ideas, so few hours! Karen, your Bible cover is gorgeous! And what a great idea to add a tissue holder on the inside. You are just tooooo clever! Karen, I love your Bible cover. I have that same fabric that I bought when I lived in TX and I am making a quilt out of it. I posted pics of the blocks on my design wall on my blog last yr. Imagine my surprise when I saw the fabric on your blog! Don't you just love this print. I wish I had bought more than I did at the time. I love your quilting. Do you quilt freehand or use a panto? I am still learning. Wow! I made the blog. 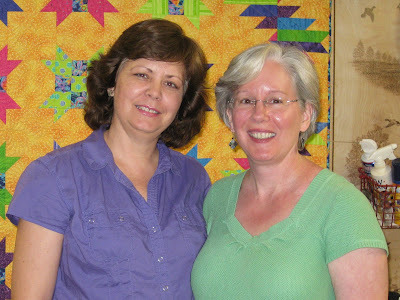 It was so good to see you again, and a thrill to meet your professional quilt model, Pixie. Too bad our visit did not produce rain, but I am grateful that this time we avoided any hurricanes! Thanks for inviting Stephanie and me into your home and studio. We had a lovely time.